Hey! I’m getting pretty good at this stitching photos into a seamless, unwonky whole! The oldest part of the church (the nave) built in Romanesque style probably dates from the 1100’s. 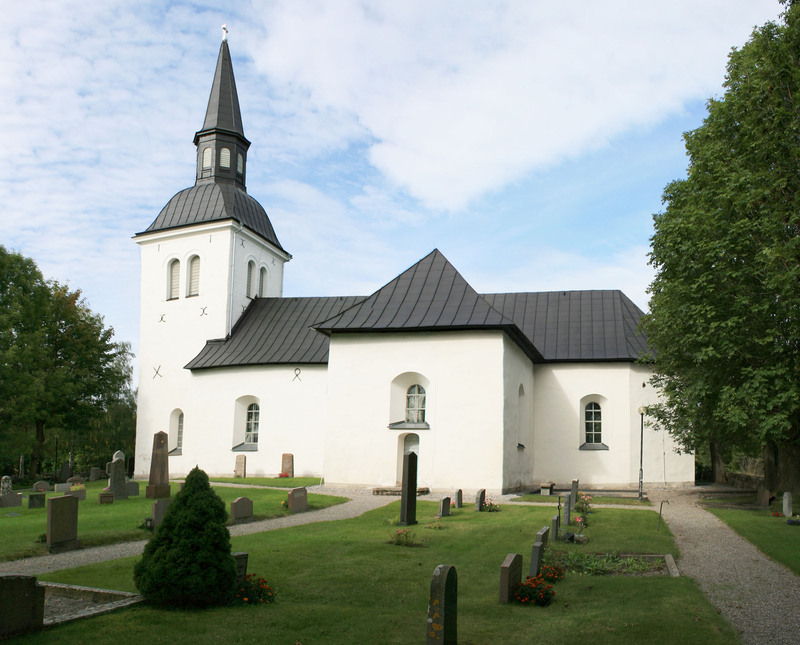 It originally had a round western tower which has no counterparts in central Sweden. The tower was built for defensive purposes and likely predated the church. The 1300’s saw the chancel extended to the east and the vestry was added. The whole church was fitted with cross vaults of brick. Years prior to 1695 the church underwent thorough restoration, but May 24, 1695, a few days before rededication, a fire completely destroyed the church. Reconstruction began immediately and ended in 1702. The rebuild which gave the church its current form. The late medieval porch was demolished, the southern entrance bricked up and the main entrance was located in the tower on the west. The church’s current square tower was erected in 1858. Interior and exterior appearances of the church are characterized mainly by the extensive late 1600’s renovation.